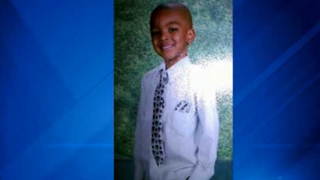 Chicago police now believe that a 9-year-old boy who was shot and killed earlier this week was lured into an alley by a gang because of his father's relationship with a rival gang. "Tyshawn Lee was murdered in probably the most abhorrent, cowardly, unfathomable crime that I've witnessed in 35 years of policing," Chicago Police Superintendent Garry McCarthy told reporters Thursday, the Chicago Tribune reports. "We're pretty certain that this is not an accident. He was not a bystander." McCarthy added that the child was targeted Monday and lured into the alley behind his grandmother's house, where he was shot and killed. "Tyshawn's father has ties to a certain gang that is in conflict with another gang," McCarthy said. The child's father, Pierre Stokes, told the Chicago Tribune earlier this week that he believed that his son was deliberately killed. "If it wasn't a target, he wouldn't have got hit so many times in the back and the face," Stokes told the Tribune. "I think he was targeted." The Tribune reports that police say Stokes has not been forthcoming in the investigation. "We've tried to interview him at least twice. I can't even tell you what he said" because Stokes used language "you can't say on TV," McCarthy said. "I'm a father, many of us here are fathers, and my reaction would be a little bit different," McCarthy continued. "My reaction would be very clearly different." It is a claim that Stokes denies, the Tribune reports. Stokes told reporters after the press conference that he has told police everything he knows. "I've been answering all the questions [police] have asked me, and I keep telling them I don't know anything," Stokes said. "I would never do anything to hurt my son." Stokes added that he doesn't have any enemies and promised that there would be no retaliation for his son's death. "It ends here," Stokes said. "Right now, there's nothing for me to do but to lay my son down peacefully." Authorities are offering a $35,000 reward for information that leads to an arrest in the case. The Rev. Michael Pfleger, a priest in Chicago, has also offered to "pay to relocate any witnesses who feel they would be in danger for providing information," CNN reports. "What happened to Tyshawn Lee took us to a new low," Pfleger said. "This wasn't a drive-by. This was not a spray of bullets. A baby was executed. A baby was assassinated right behind us in this alley." Read more at the Chicago Tribune and CNN.